Ginger and wine are two ingredients called for in most of my recipes. Ginger is highly perishable and always gets lost among the various vegetables in my refrigerator. To save time and money, I decided to combine ginger and wine in a glass jar with a tight-fitting, non-corrosive lid. Stored on the refrigerator door shelf, I know exactly where to find ginger and wine whenever I need them. Place sliced ginger in a non-corrosive container (I prefer a glass jar) with a tight-fitting, non-corrosive lid. Cover with sherry, sake or rice wine. Keep refrigerated. NOTE: Cooking sherry, cooking wine and rice wine sold in food markets contain salt. Check the label. NOTE: Do not cook with wine? No problem. Just use a few slices of fresh ginger and ignore the wine. KITCHEN HINT: Ran out of ginger wine? Not to worry. Just add the amount of wine called for in the recipe and a few slices of fresh ginger. 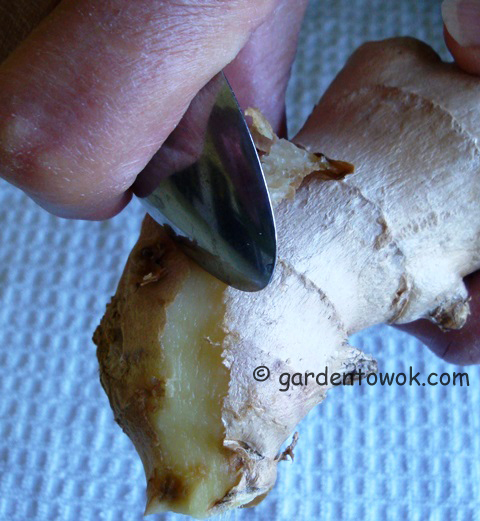 You can use a vegetable peeler or a paring knife to peel ginger. You can also use a teaspoon as in the photo above right. I have to make up some of this ginger wine. I can see that it can be very useful for many things. Good luck in this new adventure! I will certainly spread the word about your blog. Thanks Ange. As you know I am brand new at the this. So much to learn. Please give me feedback and suggestions. Appreciate and welcome all feedback and suggestions. I like this ginger wine idea, it saves a lot of time, thanks for sharing. You are welcome. Yes, it does save a lot of time and frustration. I frequently could not find the ginger when I needed it, ginger wine became my solution..
Ginger keeps very well in the freezer I just keep the unpeeled chunks in a ziplock bag and then when grated ginger is needed I just grate what I need. I leave the peel in for most recipes, but you could peel – it peels very easily once frozen too. I like the sound of this ginger wine too – I think I will give it a try! I did try the freezing method. My problem is I am not an organized person. I put the ginger in the ziplock bag (I even tried container, figuring this would be easier to locate) in the freezer, but it never stayed where I put it. Of course, when I need it I cannot find it even when I put it on the freezer door so I gave up. Ginger has become one of my most favorite things to add to meals,(even make my own ginger and grapefruit marmalade) thanks so much for this recipe can’t wait to give it a try. Hi Norma, thank you for visiting my blog and taking the time to leave a comment. What a great idea to combine ginger and wine. Glad I made a return visit! I too am glad that you came to visit. For me ginger wine is a time saver. What a great idea Norma. I think I’ll try it. Years ago I was watching Michael Smith on Food Network Canada and he recommended putting ginger into a zip lock baggy and freezing it, peel and all. Using a micro planer, you grate it frozen and need not even worry about the peel! You have fresh ginger all the time. I tried the freezing method, but my ginger is no where in sight when I need it (it seems the zip lock baggy move as soon as I close the freezer door) plus I need to get a tool. with the ginger wine I make a batch store it on my fridge door and have it for a while. I have always been afraid to use ginger in anything but I really want to grow it! Do you grow your own? 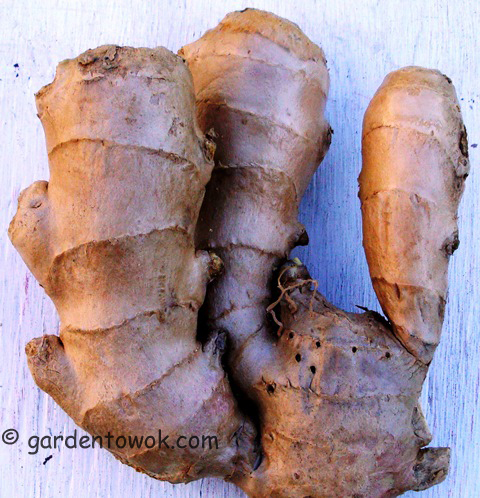 Ginger used sparingly, adds flavor to any dish, do give it a try. Ginger has a sharp edge that my kids disliked especially when they bite into little bits. To solve the problem and keep peace with my kids I used ginger slices (instead of smashed or grated ginger) this way I can remove the slices after cooking, you may wish to use ginger slices and see how you like the flavor. Years Ago I used to grow ginger, then stopped. Few weeks ago I decided to start growing it again and bought a piece from health food store and is now rooting it. This is a great idea, I will try posthaste after discovering yet another rhizome gone moldy in my fridge last night. I am curious about growing it, too. I hope you write about your process. Thanks, glad you liked the idea. Did you read my March 26 post? If not below is the link. Scroll down and there is a mention about my growing ginger. I will try to remember to post the progress. I love cooking with ginger. We get great fresh ginger in our local vege shop. I always have it on hand. Had it with my juice for breakfast this morning and with noodles for lunch today. I look forward to hearing how you go growing it. I am keen to grow it too. I bought pieces of giner from the health food store, stuck them in potting mix and they sprouted. Am going to put some in the garden and keep some in container to bring indoor when the weather starts to turn cold. We have a very short growing season not sure if I will get anything from the ones in the garden. I just saw this on your site and I love this idea, Norma. I’m forever wasting ginger when I’ve made something calling for it, except when I make ginger syrup. Ginger wine…sounds like a win-win idea to me! I of the reasons I created the recipe, glad you find it useful. Oh now you have bowled me over !!! I am a Brit living in Portugal – and in the UK we have something called … Ginger Wine or Green Ginger Wine. It is an old thing .. but we mix it with cheap whisky and make a ‘whisky mac’ ! [Most ginger wine is Scottish hence the ‘mac’ ] This is really warm as you can imagine – not like with the fizzy ginger ale – and is drunk in the winter or Christmas etc. Thing is .. out here .. we can’t buy ginger wine and although friends sometimes bring me out a bottle on the plane it isn’t easy! So ……. I am going to have a go at your recipe – especially as I love ginger in cooking too! I am sure going to have fun trying out different ‘bases’ ie sherry etc to get the ‘right’ flavour !! THANK YOU !!!!! You made my evening !!! You could try making the ginger wine using whisky to see if that’s the flavor you are looking for. Green ginger most likely is referring to young ginger. Thanks for stopping by. I hope you will write again and let me know the results of your ginger wine recreation. Oh Norma ! I am terrible I lost your recipe and blog !!! I just found you again !! Happy New Year btw! I am going to try with a few things ~ ie whisky as you suggested AND with the local aguardente which is a bit like grappa. (Having just been VERY successful making my own limoncello with it .. I hope to be on a roll!!! ) I am SAVING this link now .. so I can’t lose you again !! this post inspired me to make rice wine infused ginger…. i think it’s gonna be great with steamed fish! I think so too, drop me a note about the results. Ginger wine is something I created to make like easy in the kitchen. Yes, ginger has a lot of medicinal uses. I once made a quickie ginger wine using a dry sherry. I made a ginger syrup — sugar, water, slices of ginger and cayenne for an extra punch. Boiled it till the syrup was pungent and the ginger almost like candied ginger. Strained it and added it to the sherry and I let is sit for a week till flavours blended. It was quite a hit. Sorry for the delay in replying to your comment, I was kinda out of commission. Your ginger syrup and sherry sounds very appealing, I shall give it a try, thanks for sharing.